Zombie Fridge Magnet Set | Nerd Much? There are some pretty great fridge magnets available nowadays, so rest assured that you don’t need to have such a boring kitchen. We’ve seen fridges designed to look like Han Solo in Carbonite, and giant Gameboy fridge magnets on them to look like your favorite Nintendo handheld from your childhood. Now, there is a set of magnets for the zombie lover. 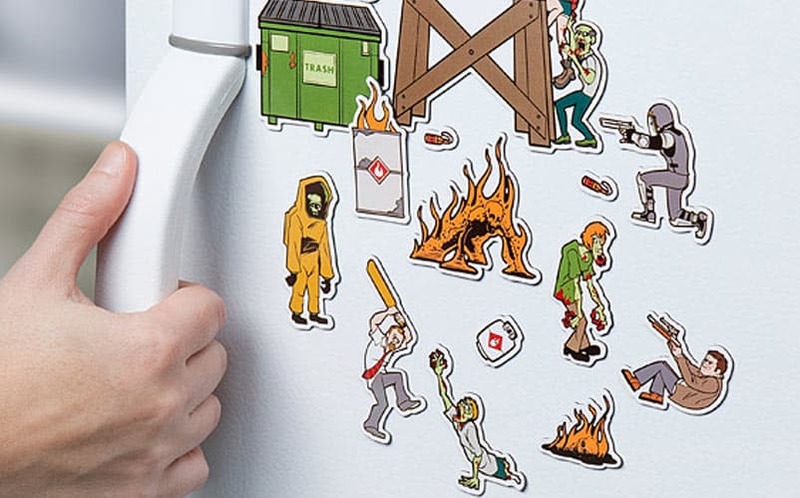 The Zombie Magnet Set by ThinkGeek will make your kitchen just a tad bit cooler. It features a slew of vaguely familiar-looking characters (such as one with a cricket bat, one goofy looking tall, skinny red-headed stoner, and a female with long blonde hair). It also includes two flaming barrels, a watchtower, a vehicle only fit for the zombie apocalypse, 12 molotov cocktails and, of course, zombies galore. Love this zombie magnet set? Check out more of the best zombie gifts here. For more cool stuff to buy featuring zombies and other nerdy things, stay tuned to Nerd Much for daily updates.